La Scena Musicale: Bronfman, Bay and the ASO Bring Austin to its Feet with Brahms! Bronfman, Bay and the ASO Bring Austin to its Feet with Brahms! What a year 2013 is going to be for commemorative celebrations! Verdi and Wagner will be honoured on the occasion of the 200th anniversaries of their births in 1813, and Benjamin Britten for the 100th anniversary of his birth in 1913. In Britten’s case, the actual birth date is November 22, but conductor Peter Bay couldn’t wait that long. I don’t blame him; Britten’s greatness only grows with each passing year and every conscientious music director should be programming his music not only in 2013, but every year. The Sinfonia da Requiem is an early work, written when the composer was 27. Prodigiously gifted, he had already written a great deal of wonderful music. 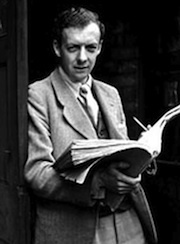 As always, the piece was written quickly (in about six weeks, by all accounts) and shows Britten’s extraordinary talent for creating unusual sonorities – an alto saxophone makes an unexpected appearance - and transparent textures. As fine as it is, the Sinfonia da Requiem raises the question of Britten’s life long struggle with symphonic form; he never did write a “symphony” in the traditional sense. He always hedged the issue by composing works like Sinfonietta Op. 1 (a very early chamber piece), A Simple Symphony Op. 4 (a work designed to be played by an amateur string orchestra), and Spring Symphony Op. 44 (which is actually a large-scale choral work). Then there is the piece we heard this evening, Sinfonia da Requiem Op. 20, which is as close to traditional symphonic form as we get from Britten (photo: right). I suspect that like Brahms and many composers before him, Britten was intimidated by the prospect of having his work measured against the giants of the repertoire – Beethoven’s nine symphonies, primarily – and more recently, Mahler’s symphonies. He may also have been discouraged by the huge success enjoyed by William Walton’s Symphony. Britten’s struggle with symphonic form aside, he was clearly far more at home with vocal music and realized early on that he had a rare gift for being able to set text to music. He could write “absolute” music when the occasion presented itself, but he had no deep-seated need to express himself in this way. More often he took his inspiration from poetry and prose. Having said all that, there is no doubt at all that the Sinfonia da Requiem is symphonic in its construction. Themes are presented in a more or less traditional way, developed and then recapitulated. As in most symphonies there are clearly separate movements although they are joined together. It is an impressive work, but one with nothing like the expressive power of the masterpiece of Britten’s maturity, the War Requiem. The second movement of the Sinfonia da Requiem functions as the scherzo movement in symphonic form. Britten gives it the title ‘Dies Irae’ but it pales beside the comparable movements in the Requiems of Mozart, Berlioz or Verdi. It didn’t help that inthis performance, Peter Bay’s (photo: right) tempo for the Con anima section was slow and plodding, rather than forward-moving. On the whole, however, Bay and the Austin Symphony gave a solid reading of the piece and deserve credit for reminding Austin listeners of Britten’s importance. Perhaps later in this commemorative year, Peter Bay will find room for more Britten in his programming. The rest of the concert was devoted to the music of Brahms. Brahms' Tragic Overture is a difficult work to bring off because it calls for a large string section, a resonant hall, and impeccable horn playing; unfortunately, none of these elements were present in this performance and the results were disappointing. Bronfman's Brahms Has Austin on its Feet! The rendering of Brahms Piano Concerto No. 1, which concluded the concert, was far more successful. The soloist was one of the most celebrated pianists of his generation, Yefim Bronfman. Bronfman, born in Tashkent, immigrated to Israel when he was fifteen. 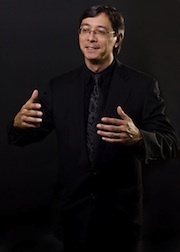 He studied at Juilliard and Curtis and has been an American citizen since 1989. He is renowned for his performances of Rachmaninov, Prokofiev and Tchaikovsky, but he’s equally famous for his readings of Mozart, Beethoven and Brahms. 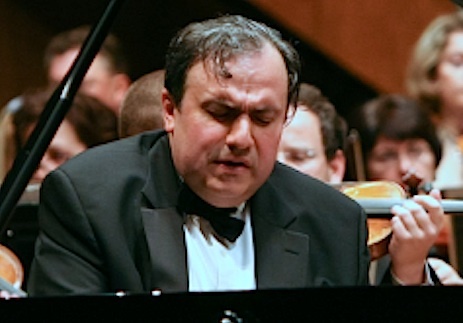 Earlier this season, Bronfman performed Brahms’ Piano Concerto No. 2 with Rattle and the Berlin Philharmonic and immediately after his Austin performances, he was scheduled to repeat Brahms Piano Concerto No. 1 with Maazel and the New York Philharmonic. In the Austin performance I attended, Bronfman had excellent rapport with Peter Bay and the ASO. The balances were ideal and the transitions navigated without a hitch. Soloist Bronfman tossed off all the technical challenges with no problem whatsoever, and played the lyrical episodes with grace and beauty. Despite all these positive elements, however, I felt there was something lacking. I must confess that I prefer more ruggedness in my Brahms and, especially in the first movement of this concerto, more of a sense of struggle. The Adagio likewise was too comfortable. Bronfman chose a tempo that was too quick to allow for the soulful bass lines to be as expressive as they can be. The section in the Adagio, in which the piano is accompanied only by horns, cellos and basses playing a low D, needed to be much louder and more sonorous. I noticed that the basses in particular were content to use a bowing that worked against that effect. Surely Brahms intended that the “molto cres. sempre” in the piano part be matched by the accompanying instruments; it is up to the conductors and the players to find a way of doing that. The final Rondo is much more interesting if it has a touch of abandon; once again, Bronfman seemed too comfortable in his approach. This reviewer’s critique notwithstanding, the Austin audience gave Bronfman a prolonged standing ovation - albeit not long enough to persuade him to give them an encore.